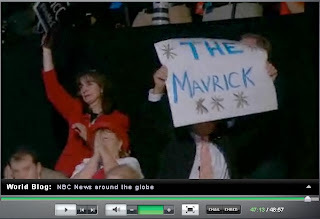 My friends, one thing I noticed during the RNC production was the sheer number of "hand painted" signs, especially during Gov. Palin's speech. My friends at YesButNoButYes saw that my friends at NBC News caught a particularly apropos one for a brief second during Sen. McCain's acceptance Thursday night. My friends, I've seen better spelling on signs at a WWE event. What does it say when a well-dressed, well-connected, well-funded attendee at a nationally televised event doesn't even bother to read the sign he's waving around like an idiot? Now we know where Dan Quayle extra "e" came from.